I don’t want to have wires running all over the garage. The sensor is a single distance sensor at the front of the parking area. LED lights can be close by. My outlets are at the front of the parking area, so I can use a power supply transformer. I found this: Sharp range sensor, so a single sensor could do it. 3 LEDs would do… too close (go back), just right (stop), too far (keep going). The power supplied via the USB cable connected to a computer changes the result of the output coming from the sensor. The formula for determining the distance is fairly accurate using the USB power, however, the values are 'stretched' using the power supply through the 5v transformer. 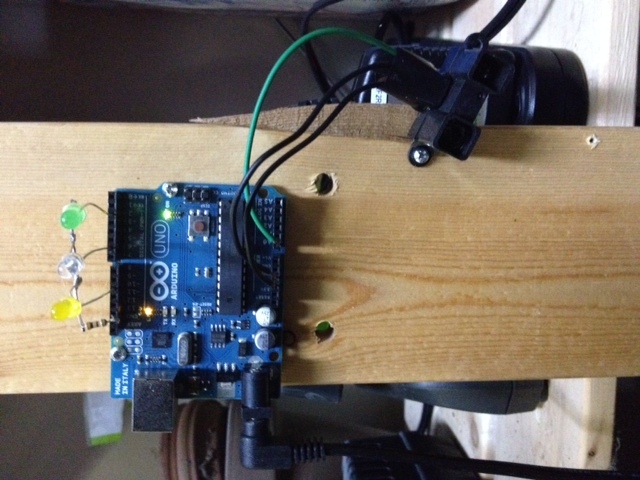 A 5v transformer is not enough power for the arduino, and need to use a bigger one. 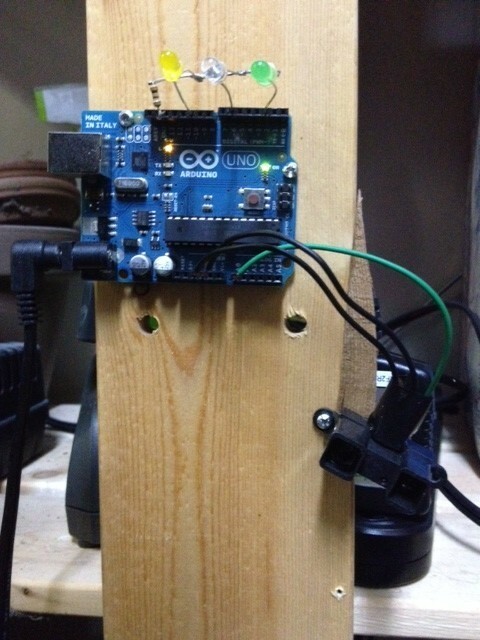 A 12v one is used and restores the distance measurements to be far more accurate and stablizes the circuit. The sensor reading is quite variable as the distance grows, and I'm not sure how to reduce the variability. Is it related to the power supply ripple? Or it's own circuit power draw? Soldering the wiring did improve the stability a little. The measurements using the IR Distance Sensor variability was minimal in my work area. I washed my car and to my surprise, the IR Distance Sensor produced quite variable distance measurements. When the sun is in direct line of the IR Distance Sensor, it cannot get a proper reading at all. Much like the sun shining in your eyes... hopelessly unable to 'see'. I found that all of the specular issues for the IR Distance Sensor quite amusing. I didn't expect that the effect would be so dramatic with regard to the material, or rather the paint job. It was kind of funny that my dirty car reduces the problem slowly over time encouraging me to not wash it. So, I'm looking for a different, and perhaps better sensor for this purpose. I was really hoping that the IR Sensor would work because it is kind of cool, but I could repurpose it for something else I'm sure. Enter the text of what you want encoded or the message you want to decode and push the Encode or Decode buttons accordingly. The codes:SSBhbSBkZWNvZGVk → I am decoded.